Sofia Ajram Has Some Magical Tendencies. Everybody, the debut release from Ja Prawn on vosotros, combines disturbingly authentic renditions of late ’70s and early ’80s movie sci-fi soundtracks, classic synth sounds, and lo-fi bent oddities, in a mischievously playful EP. Much of this album is sequencer and arpeggio-led, with overlays of pleasing monophonic synth lines held together by occasionally gritty, but always intelligent, bass and drum work. Ja Prawn ably combine the creepy and sinister with some delightfully melodic hooks, producing an EP that treads the line between ironic whimsy and authentic reproduction. Eerie synth lines and synth pads interact in conversation, threatening to partially dissolve at times, before a neat drum and bass lines tie everything back together. A variety of styles including disco and even space rock are successfully deployed, but always through the filter of their chosen retro idiom. This aesthetic ties together the EP and delivers a work that is both thematically cohesive and pleasurable. On the whole, the mix on this EP is a bit on the narrow side and fails to take advantage of what are some very good arrangements. As I listened, I could not help but wish that some of those sci-fi synth sounds had been allowed to roam further to create a bigger sound .Conversely, “Suicide Party,” a track which conjures up images of silver-clad figures being chased by zombies over rough ground, is a bit of hard work to listen to on the headphones, as it is subjected to some rather heavy-handed panning. This does not, however, detract from what is, on the whole, an excellently-visual track. 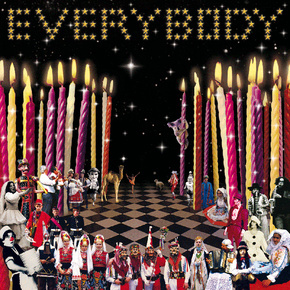 Everybody is a fine EP from a band who have honed its sound, offering intelligent music that is both playful and dark. While they could benefit from improved production values, this shouldn’t detract from what is an enticing journey into the murky world of Ja Prawn.